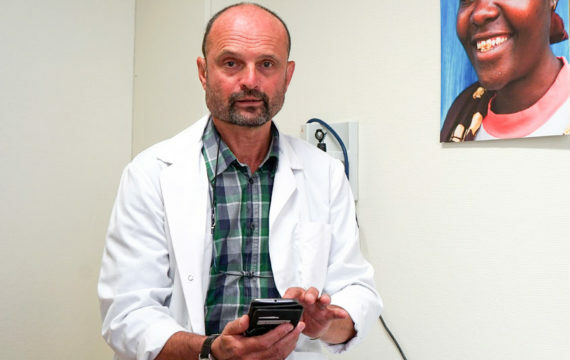 The HIV clinic of the Institute of Tropical Medicine Antwerp (ITM), Belgium, is testing an innovative way to monitor HIV patients. Stable patients who, in consultation with their physician, are eligible, may choose to replace one face-to-face consultation out of two with a digital follow-up. The project is part of a European pilot, with participation of institutes in the UK, Croatia, Spain and Portugal. The selected participants will receive their lab results and – from 2018 – digital prescriptions via a secure smartphone application. If the physician decides that everything is in order, and the patient agrees, he or she does not need to come to the clinic anymore. The next consultation will be face-to-face again. Thanks to ever-improving antiretroviral drugs, HIV has become a chronic disease in Belgium. This evolution prompted the research into new ways of follow-up which are in line with the patient’s way of life. ITM is doing this research in the context of EmERGE, a European Union funded research project. The app was developed by Podmedics, with input of the researchers of the EmERGE project. The new follow-up method will also be tested in HIV clinics in the UK, Croatia, Spain and Portugal. The objective of this pilot project is to find out whether the new method guarantees the same quality of follow-up, is user friendly for patients and doctors, and is cost effective. Earlier studies have already shown that digital follow-up has no negative impacts on the health of patients. Early September, the first patients started with the digital follow-up in ITM’s AIDS Reference Centre. Patients will be followed for 1,5 to two years, but will be able to freely use the app for at least five years. After that, a small contribution might be required. Participating patients do save time and travel costs, however. In Belgium, the study only runs in ITM’s AIDS Reference Centre.